We are delighted to be taking part in the annual Dublin Flea Christmas Market in The Point Square from Dec 7th to 10th. We'll be fully stocked with lots of great christmas gifts including our extensive range of framed prints, greeting cards and screen printed tote bags. Find out more here. 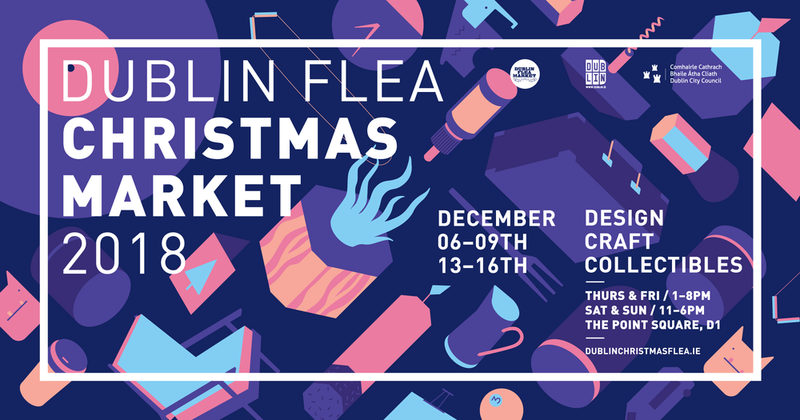 Free entry and all under one roof, the Dublin Flea Christmas Market has grown from strength to strength over the last number of years and now has over 145 stalls of Ireland’s best up and coming craftspeople, designers, artists, collectors and small independent businesses. No two stalls are alike. We process over 300 applications and curate our selection down to our very favourite quality people and products. Partnering with the LEO Dublin City and Dublin City Council, our aim for the market is to be an accessible platform to market for up and coming independent Irish businesses. So not only will shoppers find the best selection of quality antique, vintage and retro collectibles, side-by-side with some of the countries most exiting up and coming designers, crafts people and entrepreneurs, they will be directly supporting independent Irish based businesses. With a fourth day added this year we will run from Thursday 7th Dec to Sunday 10th December Thursday & Friday 1pm-8pm, Sat & Sun 11am-6pm. We think you will love what you will find and we’d be delighted to see you there.